This spring, the National Sustainable Agriculture Coalition is featuring stories from the field that highlight how organizations and the farmers they serve are building more sustainable food and farm systems with support from federal programs. This week's post provides an in-depth look at how one community-based organization is utilizing federal conservation programs to improve water usage on farms in the arid Southwest. 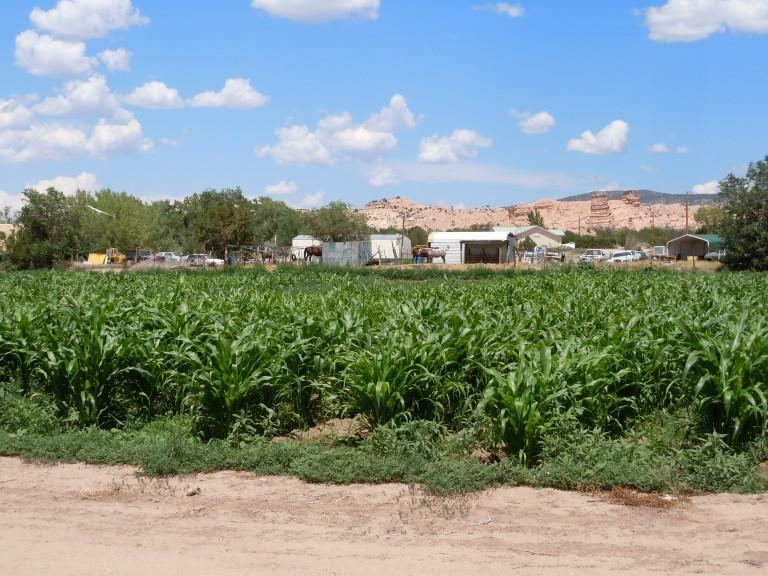 Acequia-irrigated cornfield at Monte Vista Organic Farm in La Mesilla, NM. Photo credit NMAA. Last month, Secretary of Agriculture Tom Vilsack announced that the United States Department of Agriculture (USDA) and private partners will invest $720 million in 84 conservation projects through the Regional Conservation Partnership Program (RCPP) in fiscal year (FY) 2016. NMAA workshop in Cuba, NM featuring NRCS partners. Photo credit: NMAA. One of those projects is being led by the New Mexico Association of Conservation Districts (NMACD), in association with the New Mexico Acequia Association (NMAA), a community-based farmer outreach and advocacy organization. NMACD, NMAA and eight other partners were recently awarded $3 million by USDA to facilitate and promote surface water conservation, increase irrigation system efficiencies and effectiveness, and improve water quality on agricultural lands and for downstream purposes by restoring historic irrigation systems on working lands. This is NMAA's second RCPP award in two years. 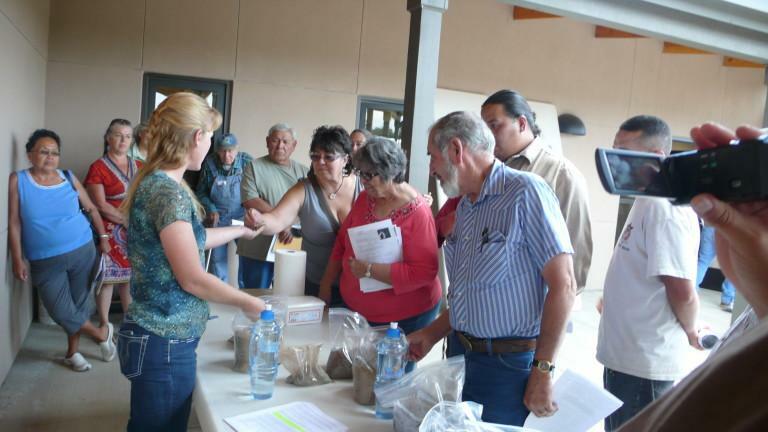 NMAA has also used another important federal program, the Outreach and Technical Assistance to Socially Disadvantaged and Veteran Farmers and Ranchers Program (also known as the "2501 Program"), to increase awareness and to expand farmer and rancher participation in conservation programs – including in their 2015 RCPP project. Acequias are community-based irrigation systems that date back to the Spanish and Mexican settlement of the Southwestern United States, but remain vital to the agricultural heritage and economy of New Mexico to this day. There are currently over 700 acequias in New Mexico, with each acequia serving anywhere from 3 to 300 families who own land along the acequia ditch. Each acequia is governed by a three-member commission and a caretaker, or mayordomo, which are all locally elected, unpaid public officials. Most acequias in New Mexico are constructed along small mountain streams. Typical acequias will have a surface water diversion from the river, traditionally made of logs and river rock; in the last few decades many acequias have modernized to incorporate concrete and metal headgates. A main ditch brings water from the acequia to all the parcels of adjacent land, and each landowner has the right to water their fields using their particular acequia. Without the proper support and advocacy from water rights organizations, acequias face extinction from redevelopment of the lands where they are based, as well as from competing demands for water use. Water is scarce in New Mexico, and the pressure to move water away from agricultural uses can halt agricultural production, ultimately threatening land ownership. Since 1998, NMAA has been at the forefront of providing support and advocacy for acequia communities. In the past eighteen years, NMAA has expanded tremendously and now provides a variety of services to farmers and ranchers across the state. For example, through their Acequia Governance Program, NMAA has worked with nearly 400 individual acequias in New Mexico with the goal of ensuring that water rights remain attached to the land through continuous agricultural production. NMAA's 2016 RCPP project will build upon an earlier $1.2 million award that NMAA and lead partner, New Mexico Association of Conservation Districts, received in 2015 to provide financial and technical assistance to acequias. Under the previous project, NMAA received applications from 70-80 acequias, but was only able to assist the 12 applicants who had already developed a project design. The 2016 award will allow NMAA, working with New Mexico Interstate Stream Commission, New Mexico Association of Conservation Districts, and seven other partners, to assist the remaining applicants who were not funded last year, and who have since developed an engineering design. 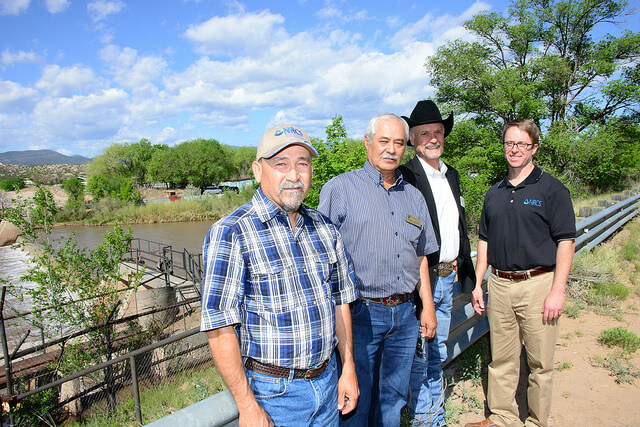 With funding from RCPP, acequias will work with the partner groups to fix leaky headgates, make improvements to the central acequia or the main waterway, and install ditch and pipe lining. These changes will improve water delivery and conservation, ensuring that producers continue to have access to irrigation. NMAA has done a great deal of work to help minority producers purchase, retain, and operate farms and participate in USDA programs like RCPP. For example, NMAA has used the 2501 program to fund its Farmer and Rancher Outreach Program, through which it has provided assistance to hundreds of acequia members. NMAA's Farmer and Rancher Outreach Program initially focused on protecting water rights and providing management support for community-based irrigation systems. In recent years, however, NMAA has used the program and funding from 2501 to assist individual landowners and acequia mayordomos in making on-site improvements on agricultural land and waterways, to encourage and facilitate continued irrigation of that land, and to promote water delivery and conservation. The Farmer and Rancher Outreach Program also works with individual landowners to help them sign up for Farm Service Agency (FSA) or Natural Resource Conservation Service (NRCS) programs – in many cases for the very first time. The areas of North and Central New Mexico with large numbers of acequia communities are also predominantly composed of Hispanic farmers and ranchers, which requires outreach agents like NMAA's, who have a place-based and cultural understanding. When NMAA first began their outreach, there were very few Hispanic farmers enrolled in FSA or NRCS programs for farm loans or conservation assistance. Through workshops that introduce FSA and NRCS agents to the farming community, and by using peer-to-peer education models, NMAA has been successful in teaching hundreds of farmers about these opportunities. Today NMAA's newsletter, which highlights workshops and one-on-one farmer outreach opportunities, reaches over 5,000 families. At events, workshops, and even on their personal farm, NMAA staff work directly with farmers, creating trusting and long-lasting relationships. NMAA's work in New Mexico is a great example of how advocacy organizations can utilize USDA programs to help them serve historically under-served producers and solve local resource concerns. Stay tuned for more profiles as we continue our Stories from the Field series.